On Tuesday 16th April, @UK PLC attended the launch of the BASDA Interoperability Charter to support sustainability and economic growth and were one of the first companies to sign up to it along with Causeway Technologies, Access Group, Intuitive Business Intelligence, BlueQube and Forbes Computer Systems. As one of the first companies to sign up to the Charter we are demonstrating our commitment to delivering integrated digital economies that give our customers a clear advantage when they work with us. The charter is designed to encourage and recognise best practice in delivering the Digital Economy and have member companies to ensure their software works smoothly with others in the market. By doing so it means that @UK’s solutions run seamlessly with minimised errors when interoperating to other systems. The launch was held at the House of Commons and was attended by a number of Parliament members and technology influencers including Stephen McPartland, MP and Director of the Digital Policy Alliance. 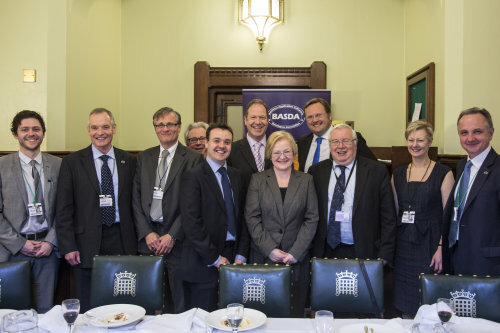 He commented, “I am delighted to see that BASDA are leading the charge on interoperability and promoting its value to the UK economy. It is important that we build strong and effective relationships between government and the IT sector in order to get a clear understanding of what can really be achieved in terms of efficiency and cost saving. Chairman and Director of @UK Ronald Duncan, said: "As a provider of various eCommerce and P2P applications, it's vital that @UK shows our support in interoperability. For years our staff have improved and mastered our integrations to making sure that our applications work seamlessly with others." BASDA – the Business Application Software Developers’ Association – has a strong track record of bringing key software industry players together to set standards which enable diverse systems to talk to each other. The BASDA Interoperability Charter is the next milestone on this journey. @UK is proud to support a forward thinking campaign and hope that other members of BASDA will sign up to the Charter too. We hope that other software companies will see the importance of creating an interoperable community and contact BASDA for more information on getting involved.